Attention public library directors, there may be a few changes to look out for on the FY17 Annual Report. I attended the State Data Coordinators Conference in Louisville, KY earlier this month and it was decided that there will be at least one data element definition change for SDCs from across the country to vote on in early Spring. However, there will be a few other updates that I will make on my own to ensure questions, definitions, etc. are clear. Be on the lookout for information regarding the upcoming FY17 Annual Report. FY15 was the first year that Kathleen Moeller-Peiffer, our State Librarian, certified the data I reviewed and cleaned up with the help of the American Institute of Research (AIR). 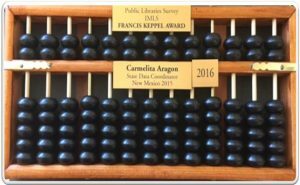 As such, she received her very own Francis Keppel Award, which is in the form of an abacus. The Keppel award is given each year to State library agencies that have excelled in the completeness, promptness, and high quality of the local public library data that they collect, edit, and submit annually. I also received a brass plate engraved with 2016 to add to the abacus award I received at last year’s conference. If you are interested in reading more about the Annual Report, please see the New Mexico State Library’s website. DRM — what is it and should I care?